There are newer versions of this map available. To see them, view all Mali maps. 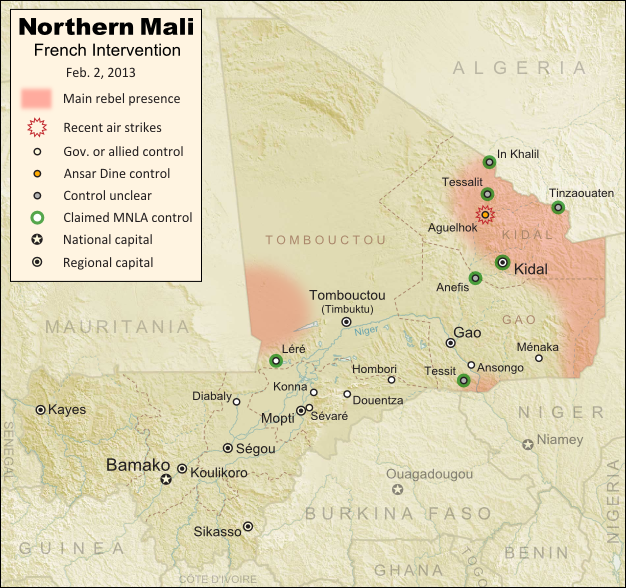 This is an update of our Mali conflict map - for the original story, see Mali Map: Islamist Control & French Intervention. Updated map of territorial control and airstrikes in Mali, as of Feb. 2, 2013. Map by Evan Centanni, modified from Wikimedia map by Orionist, using images by Carport and NordNordWest (source). License: CC BY-SA. After taking the two largest cities in Mali's north over the last week, the French military by Thursday had also secured Kidal, the last of the area's three major regional centers. The religious extremist rebels of Ansar Dine had apparently already fled the city, which was instead occupied by two moderate rebel organizations, the MIA and the MNLA, the latter of which originally took over the north last spring before being driven out by religious extremist groups. The MNLA rebels, who were originally a Tuareg-led separatist movement (and even declared an independent country in their territory), have reemerged since the French intervention began, with an apparent willingness to negotiate for limited autonomy within Mali. If fact, they did not resist the French takeover of Kidal, saying they only refuse occupation by the Malian army itself, which they claim has long abused the Tuareg and Arab people of the far north. They also claimed control of a number of towns in the region this week, though journalists have not been able to verify these assertions. Meanwhile, two other major towns near Gao have also fallen out of rebel hands. Ansongo was taken on Tuesday by forces from Niger and Mali, while Ménaka was occupied by allied soldiers from Chad. The Chadian contingent makes up nearly half of the African foreign supporting force in Mali, and unlike the others is not a member of the West African regional bloc ECOWAS. With the capture of all three major northern cities, and reports that most of the Niger River region has also been secured, the first phase of the intervention in Mali is coming to an end. The victorious French and Malian presidents made a celebratory visit to Timbuktu on Saturday, declaring that French soldiers would remain in the country only long enough for African forces to take over the peacekeeping mission. The extremist rebels have apparently fled into the desert, with Ansar Dine (or what's left of it after its split with the MIA) believed to be hiding out in the mountains north of Kidal. The only town known to be under their control is Aguelhok, which was targeted by French airstrikes in recent days. Besides the shrinking strongholds of Ansar Dine, several border areas appear to be under the influence of the MNLA rebels, though as mentioned before, they have not opposed the foreign intervention so far. MUJAO, the other major extremist group which had controlled towns in northern Mali, is apparently nowhere to be seen (for the moment anyway). Graphic of Malian flag is in the public domain (source).